Darren Rea: How did you get started in this business? It's a very strange field to decide to go into. 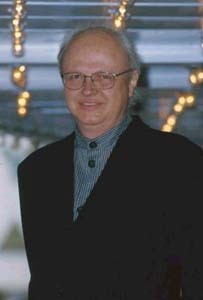 Dennis Muren: [Laughs] Well, there was no field when I was a kid. I have been interested in it since I was about seven years old. 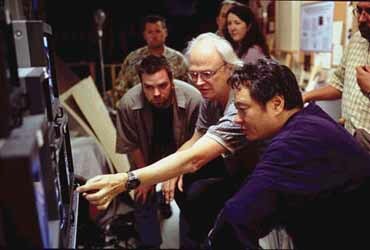 I always wanted to do special effects but there was no future in it, no business in it and it wasn't really until years later when George [Lucas] and Steven [Spielberg] came along that they needed someone with my talents - because they were making these sort of movies that people wanted to see. 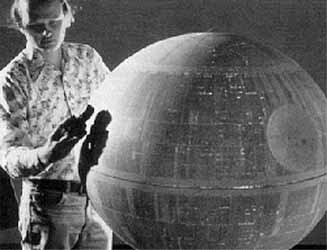 So that's when everything really started, the rebirth of visual effects, in around 1977. It was pretty amazing that I kept with it long enough to be able to make a career out of it. DR: What was the first paid work that you actually did in the industry? DM: I did some commercials for Pillsbury Dough Boy and then I did a low budget film when I was at college called Equinox which I sold and came out in theatres. Then I did more commercials, because there just wasn't much film working going on at all. There might have been a couple of big effects films, and then nothing for three or four years - and they were all studio movies. But, not being in the union, there was no way to get involved with those. I heard about Star Wars, and I really wanted to be involved to meet George, because always in my career I've followed the directors. I wanted to see how the directors did there work and learn from them. I think good directors are the ones that make the good movies and I always wanted to work on good movies. I managed to get in for an interview with John Dykstra [special photographic effects supervisor on Star Wars: IV - A New Hope] when they were just starting to hire and I've been here ever since. DR: You've received more Oscar's than anyone else alive. How does the Academy's recognition of your achievements make you feel? DM: It's really nice to be recognised by your peers and I've been really lucky managing to get involved with so many good movies and working with so many talented people here at ILM [Industrial Light and Magic]. But, you know, it's always fun going to the Oscar shows - white knuckle time, wandering whether you are going to get it or not. 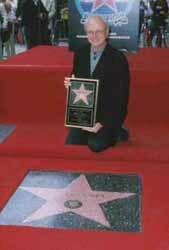 DR: You're also the only special effects artist with their own star on the Hollywood Walk of Stars. How did you react when you were told? Could you quite believe it? DM: No, I thought they'd made a mistake and that I was going to get a call saying: "Actually, it's supposed to be the comedian Dennis Miller. I think we made a big mistake, and we're very sorry, goodbye!" But, no that was really good great. I grew up in that area and walked down there about a million times and I never expected that there would ever be a special effects person there and the fact that it might be me was impossible. Again, when I was growing up there was no future in this business for doing special effects and that's all I really ever wanted to do. I just followed my dreams and my passions and a couple of times I almost got into doing something else that paid money. But I just managed to hold on to those dreams and then finally George and Steven came along. DR: Looking over your career which is the effect, and the movie, which you are most proud of? DM: I really liked The Empire Strikes Back. I think that was the hardest movie I've ever worked on and probably the most rewarding. We'd just moved up here from Northern California and we were crewing the movie from local people, getting as many here as we could. They didn't know how to do visual effects and we had to teach them and build camera gear. The vision of Empire was way beyond what the first Star Wars was - which was primarily space shots and space battles. Empire has the walking machine battle, space battles and a lot more with a mass of Star Destroyers. There was all sorts of stuff in that movie that we had to do in a relatively short time frame. 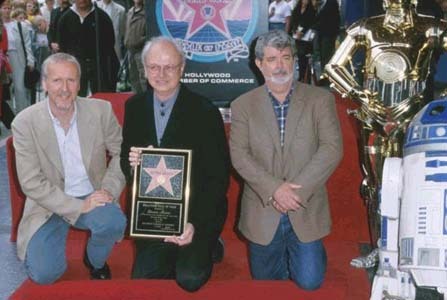 I'm also very proud of what we did for Terminator 2 and Jurassic Park. These were released at the time when we were discovering what we could do with computer graphics. This also helped establish computer effects in the industry as it enabled us to get the desired effects in the movies on time and on budget. 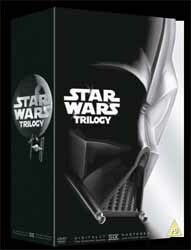 DR: The original Star Wars trilogy is finally making it's way onto DVD in September, with additional sequences and re-shot special effects. When the special edition versions of the first three Star Wars movies were released a few years ago on video, how did you feel about going back to a project that you'd already done once? And how did you feel about coming back to it for a third time for the DVD releases? DM: I wasn't too excited about spending the time working on it, but I was really glad that we had a chance to fix it. So many of the shots in the films were not quite up to it - we ran out of time and everything else you could possibly think of. The technology, at the time, was as good as it could possibly be, but I've always cringed at a lot of the effects. I saw it as an opportunity and, I think on the first film, George came up with 50 shots and I came up with 50 shots to redo and we put a lot of effort into that and did most of them with computer graphics. I oversaw them, but didn't actually get into doing them day to day. I felt that as long as the original versions were still around for people to see that redoing them was okay - it didn't really bother me, mainly because I had been so frustrated with a lot of it from the beginning. There were time constraints, money issues and also the fact that the technology was not available. It was sort of the last breath of the industrial age - with machines running the film through the optical printers many many times meaning that the holes in the film would stretch and sometimes break and then you had to start a shot all over again. If anything went wrong it showed up as something on the film. We just did it as good as we could do it. But, once we went digital, those problems were gone and it was up to you, as an artist, what you could do with it. I embrace it, but I'm also aware of the areas that we still have to go to improve it. But, it's made the work so much better. DR: Did you find that transition easy or at times, at the beginning, did you resist the changeover because you were so familiar with the tried and tested techniques? DM: No, not at all. I was one of the main people who pushed it. It was extremely frustrating at the beginning. I did Young Sherlock Holmes in 1985 and Willow in 1988 and I was struggling as hard as I could to be able to figure out how the technology worked and how we could actually do what we wanted and get it done on time. We were still trying to find out what it could do, what it couldn't do and trying to learn the language of the computer graphics people. Only through nostalgia do I kind of imagine the romantic days of the miniatures and the smell of the paint and the feeling of the rubber. 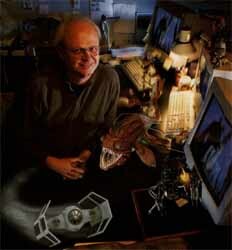 But I remember very much, especially with the Rancor sequence in Return of the Jedi, it was very tactile. 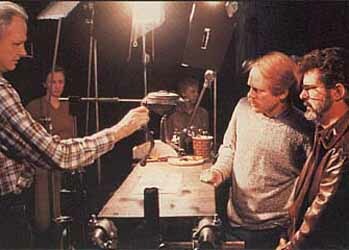 It was a hand puppet that Phil Tippet's [creature designer] arm was up and we were jammed in this little room trying to shoot it with six people standing around and smoke and everything and it was very tactile but it was horrendous. Some of those shots were 100 takes and we never really knew if we'd managed to get it right or not until the next day. And we shot the movements backwards to try to make them look better. We tried fast speeds and slow speeds - whatever, to make it look different from a hand puppet. 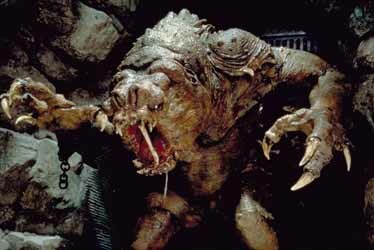 DR: Weren't you originally going to have someone in a costume playing the Rancor? DM: Yeah, George originally wanted to try that and we actually sort of got something together and when he looked at it he thought that that wasn't really the way to do it. So he went for the hand puppet approach - which was much more controllable. DR: Can you watch a movie and be caught up in the magic? Or, do you sit there picking apart the special effects? DM: No, I can still enjoy the movie. I have to view my own work that way - every time I look at my own work I imagine that I'm seeing it for the first time. That's really an important trait to develop. You have to be able to view it as a theatre goer seeing it for the first time, not the person who has been working on it for a month or two. So, I can do that very easily when I view a film. What I try to do, when I am watching someone else's work and have an opinion on it, is file that though away until the movie is finished. But I don't let that spoil my enjoyment of the movie - I can separate that pretty well. DR: Was the work of Ray Harryhausen inspirational at all? DM: Oh yeah, very much. I was a big fan of Ray's. I used to visit him when I was living in LA. I've known him since I was about 15 years old. But, in addition to stop motion, I also liked the work of Arnold Gillespie, who did the Wizard of Oz, and Fred Sersen, who had done a lot of stuff at 20th Century Fox - including The Rains Came. I was an all round effects person. I liked lots of effects films, like The Invisible Man films. 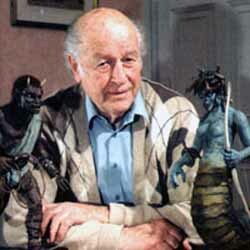 All sorts of films appealed to me, as well as Ray Harryhausen's [pictured left] work. I come from a more diverse effects fan background than most people do. There are a lot of Ray's fans around, but not too many people who like to see a good dam breaking or a tornado, or something like that [laughs] which I always enjoyed watching. DR: You've thrilled a lot of people with your effects in movies like The Empire Strikes Back and Indiana Jones and the Temple of Doom, but you've probably also been responsible for many nightmares. Is that something that people come up to you with issues about? DM: No, I never hear that side of it, only the other side. Maybe those are the people that are cowering in the corner and never approach me [laughs]. I think you're the only person that's ever asked me that. I can understand it though. If you're really young and see some of the things I've done they can be pretty creepy. 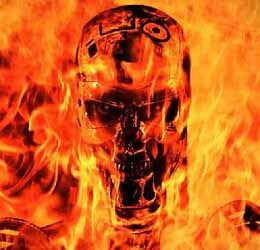 DR: If the special effects industry hadn't taken off what career path do you think you would have followed? DM: I don't have any idea. There's nothing else I'd really want to do - and there's nothing else I'm trained for either. I thought about getting a job as an inhalation therapist, which is someone who helps people with their breathing - people who have had lung problems. But I just got that job out of the newspaper and I thought: "Hey! I can do that." I probably would have continued doing commercials as long as I could. I don't really know. I've got plenty of friends who didn't ever really make it in the business. I'm just one of the lucky ones who did. DR: With each movie you make are you attempting to push the boundaries to push yourself, as well as the technology? DM: Yes, as long as it doesn't distract from the film. If the film gives you the opportunity to try something new with graphics or the imagery then that's very satisfying. I like doing the showy visual effects. I'm not a big fan of the ones that are invisible - like where you have an effect of say a crowd of 20,000 people. That's not as exciting to me as some big creature running around or spaceship flying, which you know is impossible. DR: Has there been a project which has been such a problem that you've almost given up on it? DM: [Laughs] I didn't know if we were going to get the first Star Wars movie and, especially The Empire Strikes Back done on time. It was so hard getting that done. Many times during Empire I just thought we were not going to make it - the sequence wasn't looking right and we weren't going to get all the shots done on time. I'd have to say that Empire was the one project that stands out as problematic. But most of the time I try to come up with an alternate way to do something. That way if I see we are running into a road block - the technology's not ready or the people aren't quite pulling it off, or whatever reason, I'll try to immediately switch gears to another approach. I'm good at avoiding that sort of thing from happening. DR: Looking back over your career, of all the characters that you have been instrumental in creating which would you say is closest to you? DM: Erm... I don't know. I'd never previously thought about that. 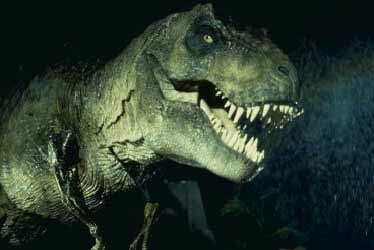 I don't know if it's the closest to me, but the thing I really like looking at the most is probably the T-Rex from Jurassic Park. I can never get enough of looking at that guy. It was a lot of fun making it. As you're making it, you're making decisions on things like how scary should it look? To be an adult and to be able to play with this character and have it do anything you want... that's pretty fulfilling - it's really neat. And to have so many people in the world look at it and like it, that's really nice. That was a lot of fun - making a real T-Rex.